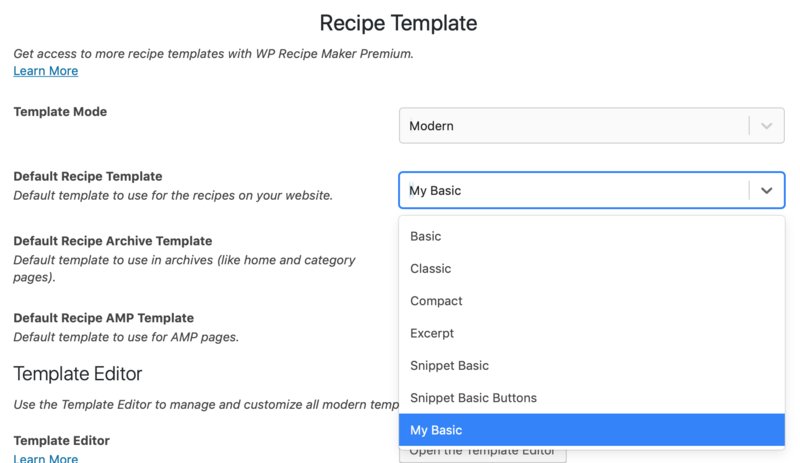 You can access the Template Editor from the WP Recipe Maker > Settings > Recipe Template page by clicking on the "Open the Template Editor" button. Take note that this button will only show up if the Template Mode is set to "Modern". The Template Editor cannot work with Legacy Mode templates. We highly recommend to set the "Default Preview Recipe". 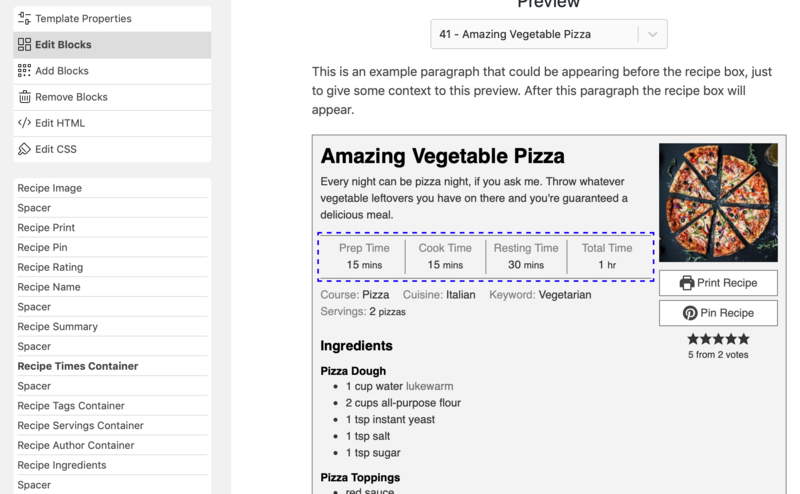 This is the recipe used to preview in the template editor. 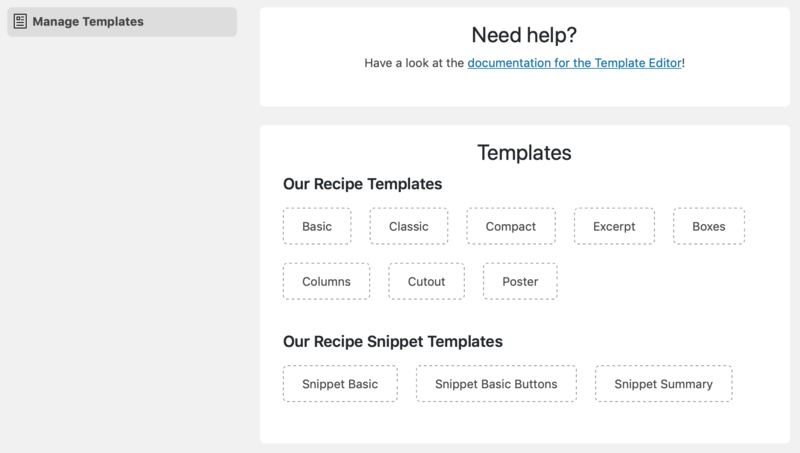 You want this to be a recipe that has all the fields set that you use on your website. If your preview recipe doesn't have a recipe video set, the recipe video section won't get displayed in the preview either, for example. Don't have a recipe yet? Create one first! The first screen you see after opening the Template Editor is a list of all the default templates. You can click on the templates in this overview to show the available actions. It's not possible to edit the default templates (we want you to be able to go back to a default whenever you want), so the next step would be to create you're template. You do not have to start from scratch though. Click on the template you like best and then on the blue "Clone Template" button. You can now pick a name for your own template. After cloning, click on your own template to see more actions available. You can rename, delete and start editing now. You can get to the actual editor by clicking the blue "Edit Template" button. This button will only be active for one of your own templates, so make sure to make a clone first as shown above. "Editing template" in the top left shows you the name of the template you're editing and allows you to save or cancel any changes you've made. Below that you'll find the different editor modes. Right now it's in "Template Properties" mode. We'll cover these different modes below. Depending on the mode you're in you'll see some properties you can edit in the bottom left. The main part of the screen is taken op by the preview component, giving you a live preview of your recipe template using the preview recipe you've selected. In this mode you'll be editing properties that apply to the template as a whole. Think background colors, borders, font families, font sizes, text colors, and so on. In this mode you're basically editing variables used in the Template CSS. This is where most changes can be made. At first you start out with a list of all the blocks that are in the template. Hovering over them will highlight the block inside the recipe template as well. Click on a block to start editing its properties. In this mode you're basically editing shortcode attributes for the different blocks. 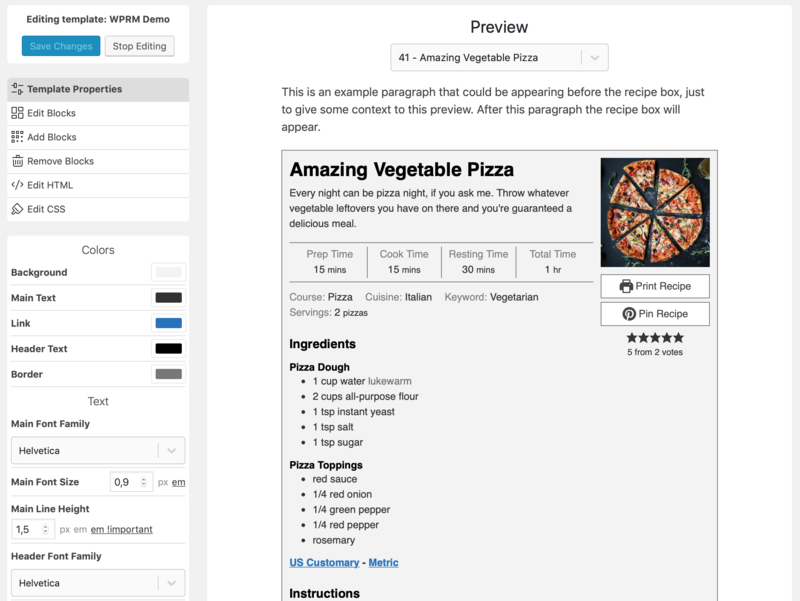 Use add blocks to add a new recipe block to the template. You'll get a list of all available blocks. Just click on what you want to add. The next screen will ask where you want to add the block. Select an existing block and the new block will be added after that one. 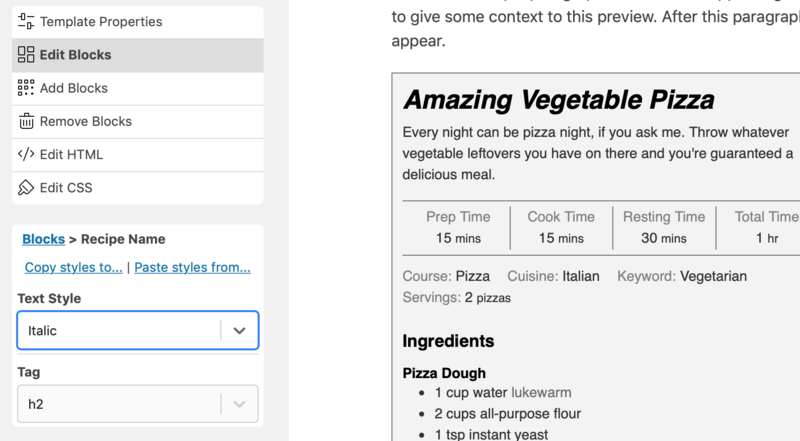 Just click on the block you'd like to remove from the recipe template. You have direct access to the Template HTML in this mode. Any changes you make here will be reflected in the preview as well. This can be used for added hardcoded text to the template, for example. You have direct access to the Template CSS in this mode. Any changes you make here will be reflected in the preview as well. 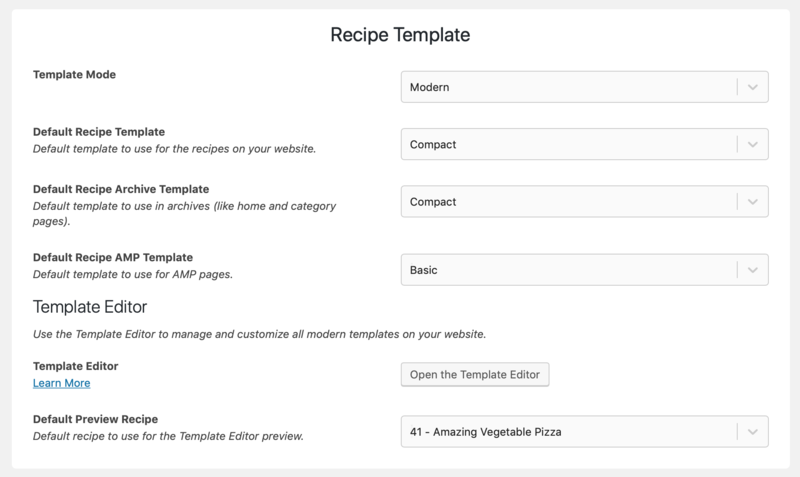 After creating your own template, don't forget to change the Default Recipe Template setting if you want that template to be the new default for your recipes. 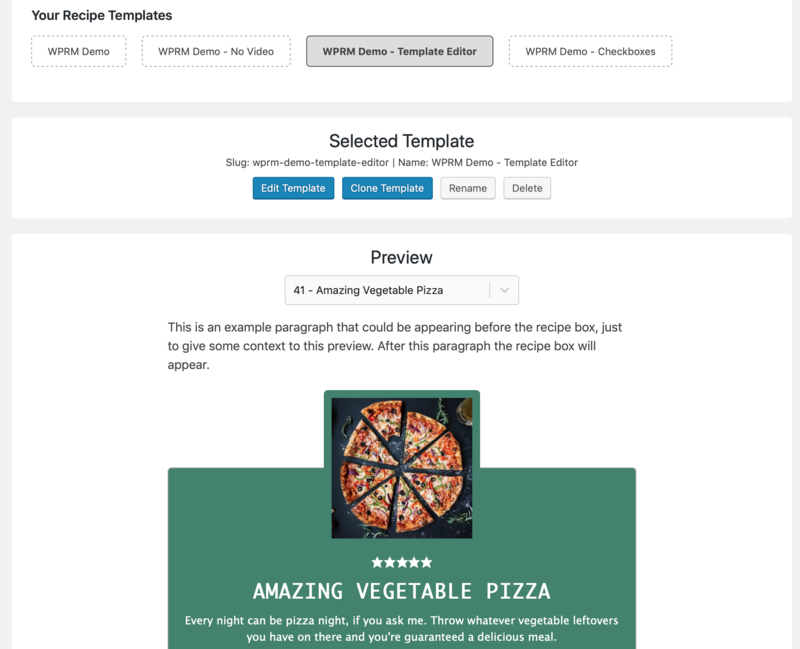 Changing the default recipe template will change the template for all recipes on your website at once!